The best solution for repairing very small-sized components requiring the highest precision. You can trust that we will always stock the best quality products. Our team are highly trained to offer helpful, impartial advice on all products and we provide an excellent after-sales and a great choice of expert services from delivery to installation. 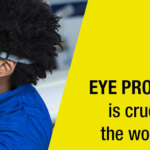 We set highly competitive prices for all our products; If we find a competitor offering a better price for the same individual product, sold with the same service conditions, we'll lower our price to match and on our website, including when a competitor is having a sale. 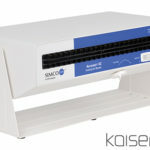 Sustainable Quality Extended Coverage Benchtop Ionizing Blower with Heater. Are there any simple tips on a desoldering process? Use a tip with a larger diameter than the pad to achieve maximum aspiration and thermal efficiency. Place the tip with the component terminal in the hole. When the solder liquefies, gently rotate the tip so that the component terminal can be lifted off. Press the vacuum pump button long enough to remove the solder. After pressing the desoldering key there is a slight delay until the self-contained vacuum pump stops. This makes sure that the vacuum circuit is completely empty. If any solder remains are left on a terminal after desoldering it, resolder it with fresh solder and repeat the desoldering operation. What is JBC Tools Compact Line? 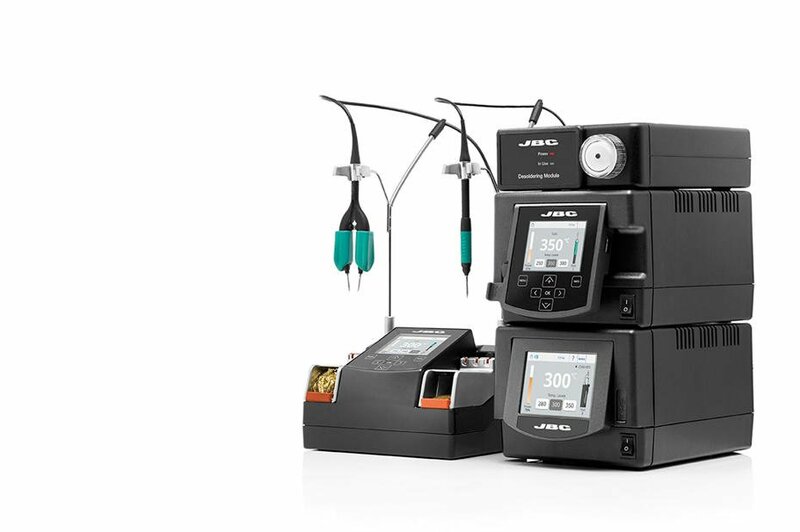 Using the JBC Tools exclusive heating system, compact stations suit your soldering and desoldering needs in the minimum footprint. 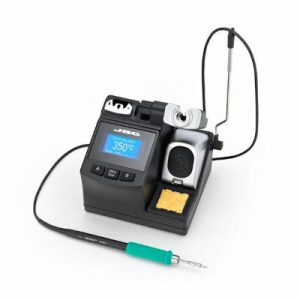 The perfect solution for precision soldering jobs. 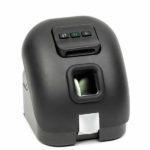 For soldering in general electronic applications. The solution for soldering and desoldering by using microtweezers. 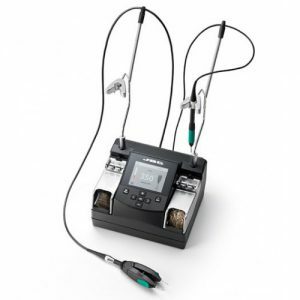 Soldering station with a solder feed iron for intensive or free single-handed jobs. 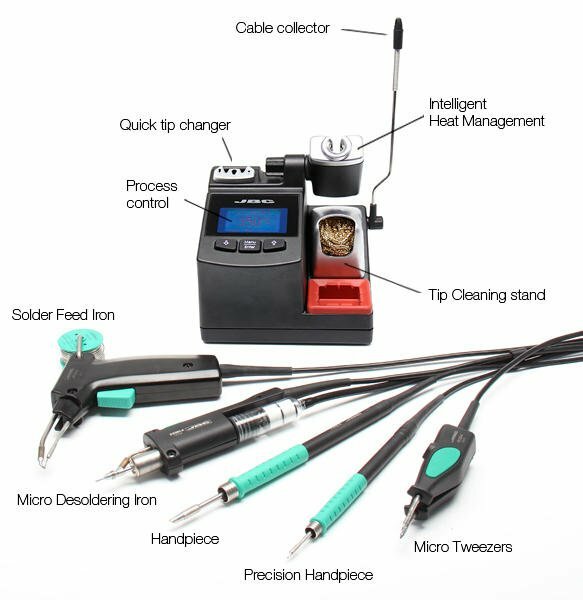 Desoldering station with electric pump for precision jobs. For precision desoldering jobs by using a pneumatic pump. What is JBC Tools Premium Line? 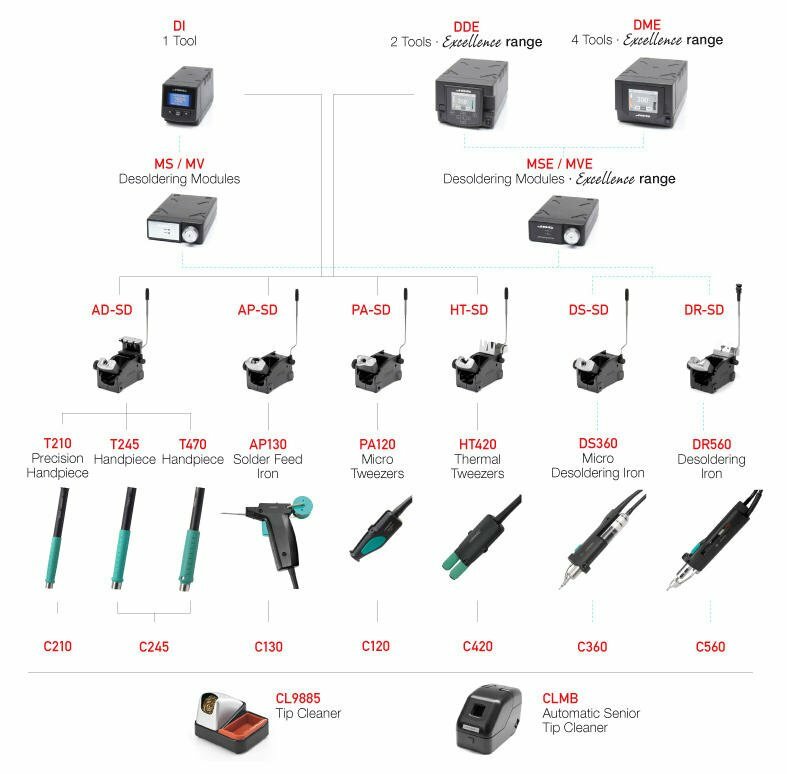 JBC Tools premium stations are complete modular kits suggested by JBC to satisfy all your soldering or desoldering needs. They are designed for industrial and extensive use with the JBC exclusive heating system that increases work efficiency thanks to its fast temperature recovery. The range includes different models, from micro work using Nano stations to the highest power requirements using the Heavy Duty station. What is JBC Tools Modular Range? JBC Tools modular range is a combination of stackable control modules to get your complete personalised set-up. All you need to do is choose a control unit according to the number of tools you need. Every control unit is compatible with all JBC tools. All the units incorporate JBC’s exclusive heating system that increases work efficiency thanks to its quick temperature recovery.